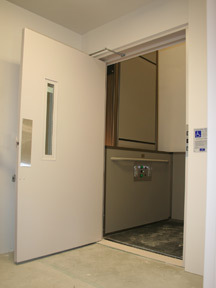 The Genesis Shaftway model is a vertical platform wheelchair lift. This style lift has a capacity or 340 kg (750lbs.) and can provide access up to 4343mm (171"). The Shaftway model is designed to fit the lift components within a shaftway built by other to Garaventa Lift specifications. The Shaftway Model can be designed to blend and compliment the building design at a fraction of the cost of an elevator.